Turn adverse comments into a stepping stone to success! Do other people's opinions get you down? Need a way to cope with them - INSTANTLY? This incredible subliminal audio recording will quickly and easily unleash ALL of your inner strengths and boost your confidence! Using the latest in subliminal messaging technology, the Learn to Handle Criticism session delivers thousands of powerful, positive, confidence-building messages directly to your subconscious - unlocking the self-assured you that lies within! And it?s 100% risk-free! If you?re not completely satisfied with the astounding results, let us know within 90 days and we?ll refund your order in full. Don?t let criticism hold you back! 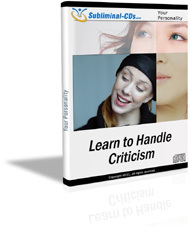 Purchase Learn to Handle Criticism TODAY and enjoy a healthier, happier outlook immediately! Criticism is my springboard to success!